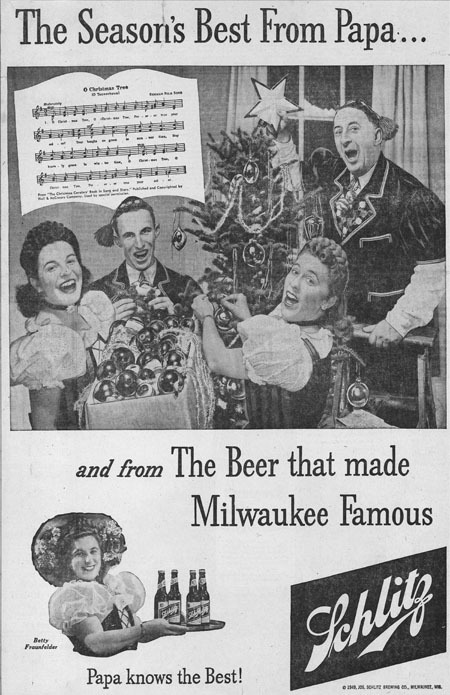 This Milwaukee newspaper ad features Rheiny with a corn cobb and a bird call whistle luring a turkey out of a tree. 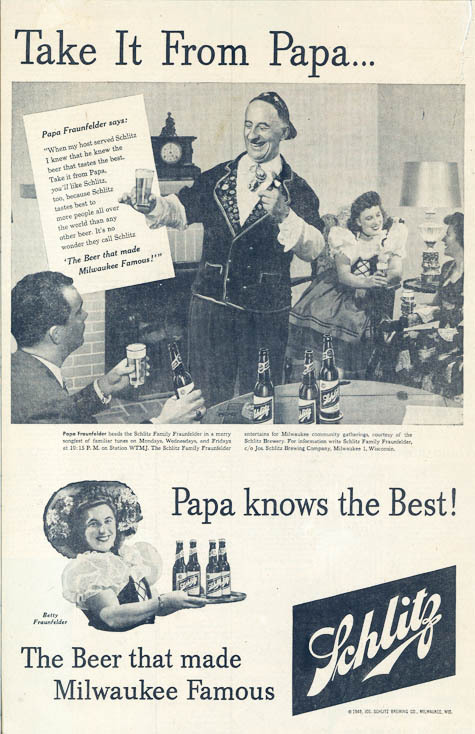 The text says that Papa advises, "Offer the bird a can of Schlitz, every wise bird comes running for Schlitz." 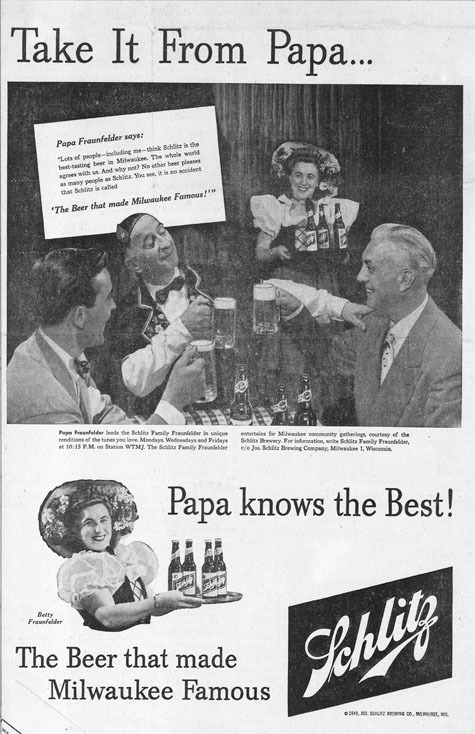 The ad also promotes a Fraunfelder radio program on Mondays, wednesdays and Fridays on Milwaukee radio station WTMJ. Click to Enlarge Photo. 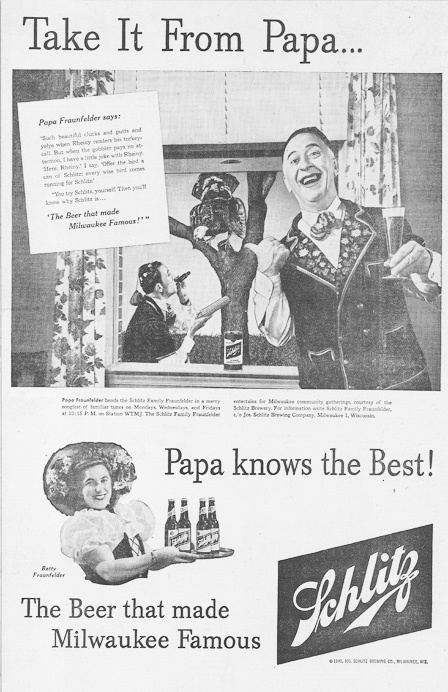 This ad commemorates the Christmas season with Ruthie, Rheiny, Betty and Papa singing while they decorate the tree. In the left hand corner is the music to the German yule song, "O Tannenbaum." 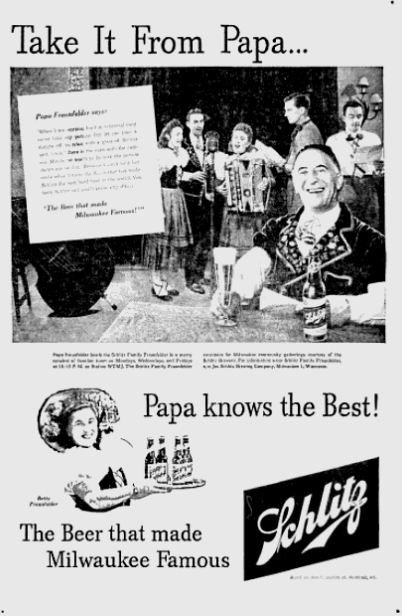 Unlike the other ads, there is no reference to the Fraunfelder radio program which had apparently ended earlier that month after a five-month run. Click to Enlarge Photo. 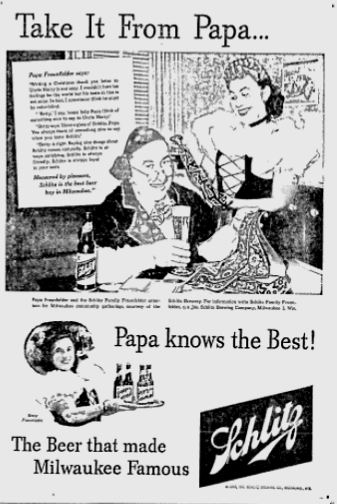 Betty's advice to Papa on writing a Christmas Letter: "Have a glass of Schlitz, Papa, you always think of something nice to say when you taste Schlitz." 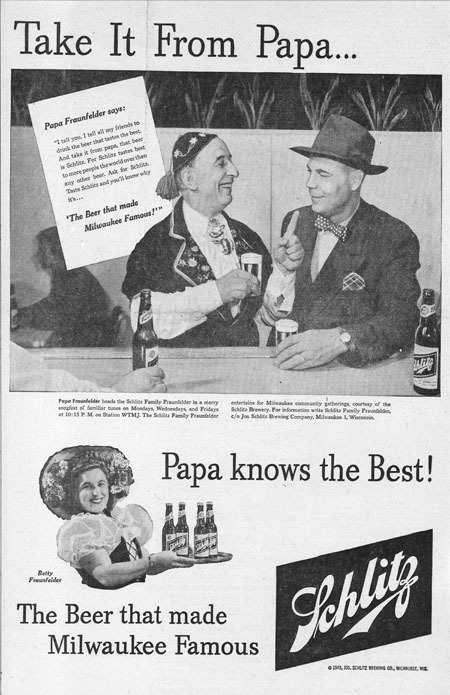 Papa says, I can't tell you which beer will taste best to you but I can tell you that Schlitz tastes best to more people all over the world." 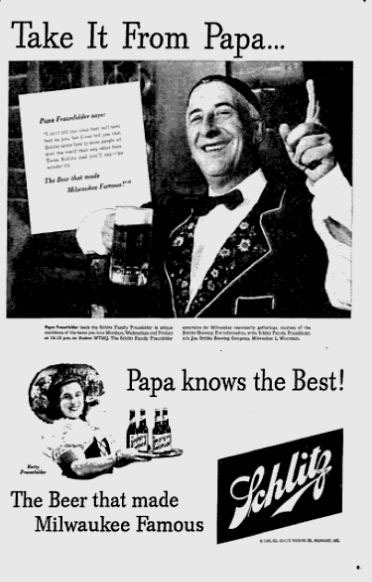 Papa says, "Lots of people -including me - think Schlitz is the best-tasting beer in Milwaukee. The whole world agrees with us. And why not? No other beer pleases as many people as Schlitz." Click to Enlarge Photo. 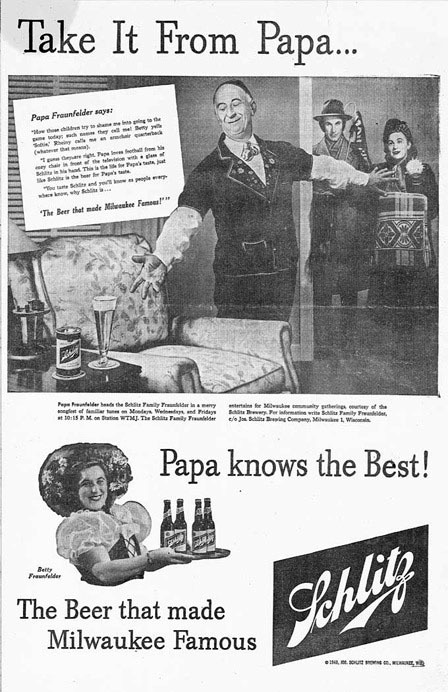 Papa says, "You see, its no accident that Schlitz is called 'The Beer that made Milwaukee Famous!' " Click to Enlarge Photo. Papa says, "One of my Polish friends invites me to a wedding, but me oh my, it costs $8 to break a plate. Think nothing of it Papa, I say to myself. The beautiful bride brought me a bottle of Schlitz One taste of Schlitz and I am all smiles again." Papa says, "When I'm working hard at rehearsal, they never take my picture but let me take a minute off to relax with a glass of Schlitz and." click," there is the man with the camera." 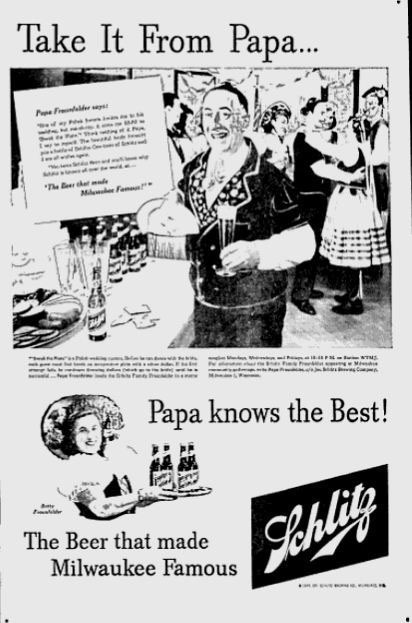 Papa Fraunfelder's 55th Birthday is celebrated in this advertising. 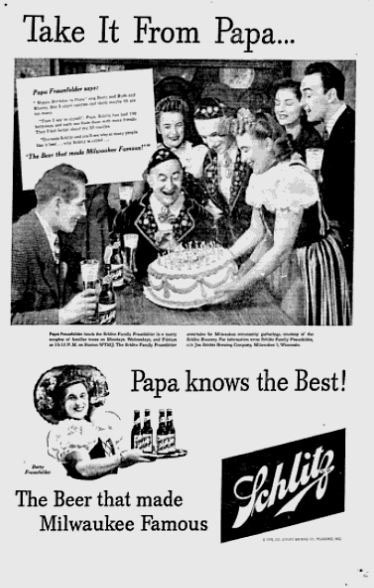 "Schlitz has had 100 birthdays and each one finds them with more friends," said Papa. 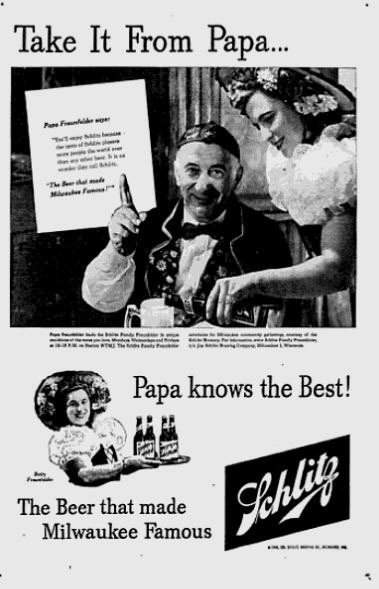 Papa says Schlitz pleases people the world over. 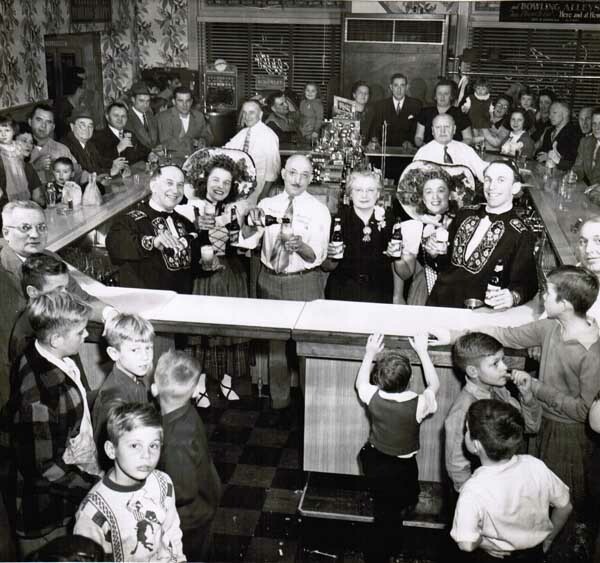 It's no wonder they call it Schlitz, the beer that made Milwaukee famous." 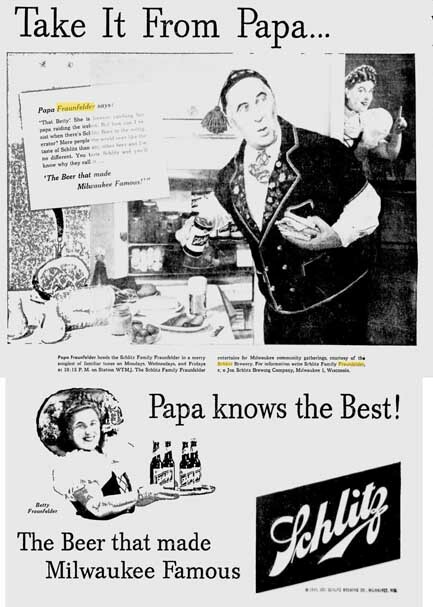 Papa shown raiding the refrigerator for a sandwich and a can of Schlitz. "That Betty." She is forever catching her papa raiding the icebox. But how can I resist when there's Schlitz Beer in the refrigerator? More people the world over like the taste of Schlitz than any other beer and I'm no different. You taste Schlitz and you'll know why they calll it...'The Beer that made Milwaukee Famous.' "
Help us find an original newspaper copy so that we can create a readable web version! 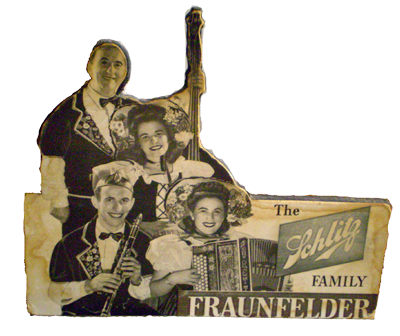 Here is a "popup" or table advertising for Schlitz Family Fraunfelder, circa 1948-49. This photo of the poster was provided in June 2014 by Jerry Krahn, who received it from DuAne Dogs. DuAne's husband, Normie Dogs, led the Melody Boys Orchestra in Mayville, Wisconsin. The group's music included polka and waltz. 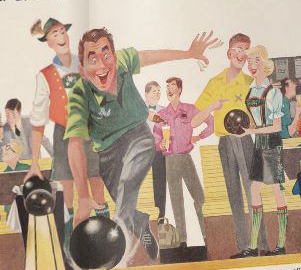 The below 1957 Schlitz Ad in International Bowling Industry Magazine was republished in November, 2012 with an explanation that the inconsistent characters dressed in lederhosen was a reference by the artist, Frederick "Fritz" Siebel, to the Swiss Family Fraunfelder Schlitz advertising in the 1940s. 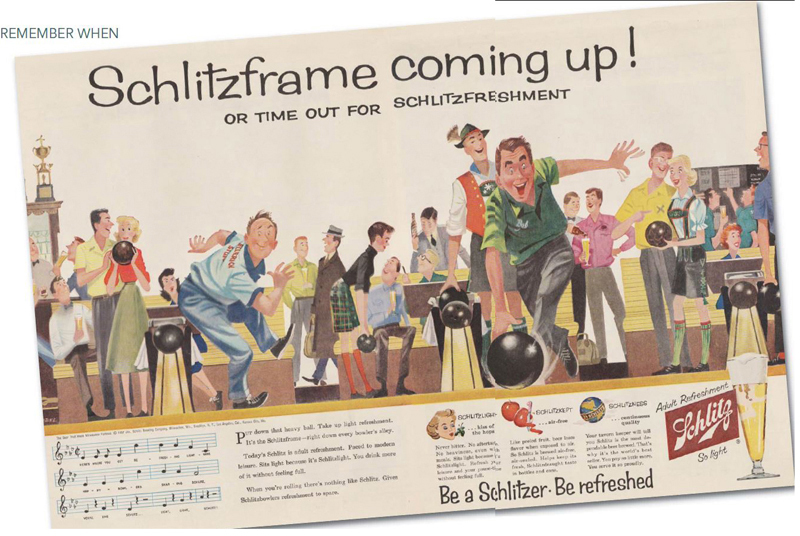 The 2012 "Remember When" article described the lederhosen characters as "creating homage to the Fraunfelders who were one of the first spokespeople for Schlitz. "Siebel was a Vienna-born commercial artist, doing editorial illustration work for magazines like Collier’s, posters for Paramount Pictures, major children’s books for Random House like “A Fly Went By, (still a best seller and Random House’s first kids book), Shell Oil company ads, Textron, and Ballantine Beer. He created the “Mr. Clean” cartoon character for Proctor and Gamble's cleaning product. A Fraunfelder sidebar that appeared with the 2012 article is below.